Kuklin, Susan. 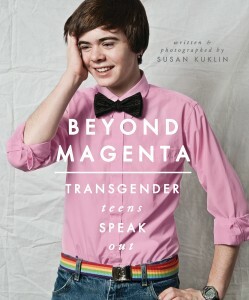 Beyond Magenta: Transgender Teens Speak Out. New York: Candlewick, 2014. Print. Summary: Photographer Susan Kuklin compiles the stories of 6 transgender or gender-neutral teens as they transformed from male to female or female to male. Whichever way they go, these young souls discover that to be happy with who you are on the inside, you must also feel comfortable with what you are on the outside. Critique: In honor of Caitlyn Jenner’s debut to the world, I just had to share this very excellent book! Whether the former Olympic gold medalist’s gender transformation had you clapping your hands or scratching your head, this book is worth your time and attention. Kuklin profiles six teens and pretty much transcribes their responses to her interview questions. The result is their voice, their take, their experience and profound insight. 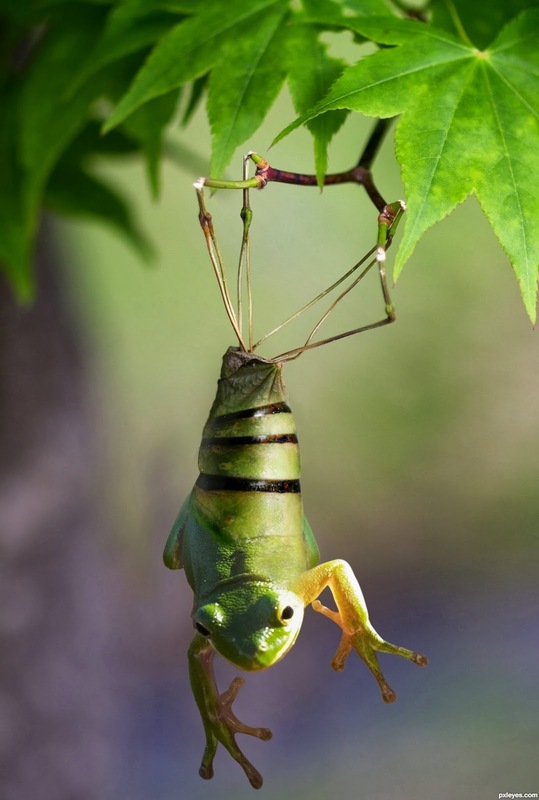 Photographs fill up other pages, tracking the metamorphic transformation. These photos are more than before-after snaps. They are a revelation of what it looks like when the soul does not harmonize with its shell–and how radiantly it glows when it does! The stories all revolve around the central question of happiness. What would you be willing to do in order to be happy? It’s a fair question; one we all face. This book as a lot to teach about the nuances that differentiate gender from sexuality, as well as queer from gay from trans from a million other potential identities. Perhaps the photo-essays from Cameron (who is also featured on the book cover) say it best, likening gender to a spectrum in which some people float while others swim. Unlike floaters, swimmers control where they are on the spectrum at any given time. Is someone in your life learning to swim that spectrum–a friend, a sibling, a partner, a child, a parent? Maybe just you. Either way, when it comes to achieving happiness, don’t get stuck dog-paddling! Fleming, Candace. 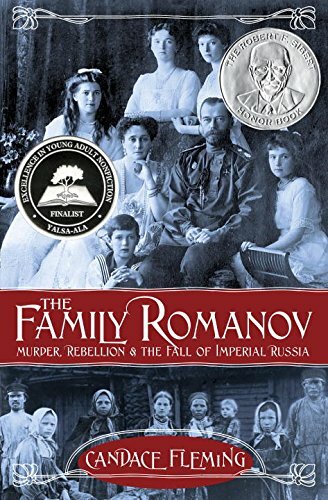 The Family Romanov: Murder, Rebellion, and the Fall of Imperial Russia. Schwartz & Wade, 2014. Print. Summary: When two young, royal people meet, fall in love, and marry, what else but a Happily Ever After could possibly await them? Well, in the case of Nikolai and Alexandra Romanov, its anything but. How about watching the country they rule slide into an agonizing civil war that eventually results in the brutal murder of their entire family? Critique: There are many reasons why Flemin has received the Boston Globe-Horn Book Award and a Golden Kite Award for her nonfiction (with a Sibert honor and YALSA finalist recognition for this book to boot). But the best reason is that she writes ripping page turners, by which I mean you darn near rip the pages out of the book to see what happens next! In this example, Fleming establishes a teasing structure whereby she introduces the Romanovs at the height of their glory, wealth, and power, all while deftly hinting at debilitating secrets and an inevitable tragic demise. Sprinkled throughout the narrative are “peasant interludes” taken directly from diaries or newspaper accounts. Unlike commercial breaks interrupting your favorite crime drama, these passages contribute an outsider’s perspective, further illuminating what the rest of the world saw as the dark side of Romanov rule. 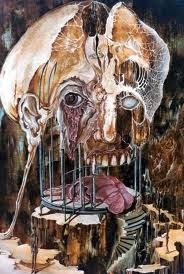 Scope under the skin of her words and you’ll find a very standard syntactical anatomy. Where some writers give you pagefuls of damask, Fleming gives you denim: succinct, functional, with an as-a-matter-of-fact style. No, denim is not as fancy or flashy as damask, but it is durable. Good thing, considering all the burn marks your fingers will leave on the pages as you race along the downward spiraling vortex of tragedy marking the last third of this Happily Neverafter Tale.